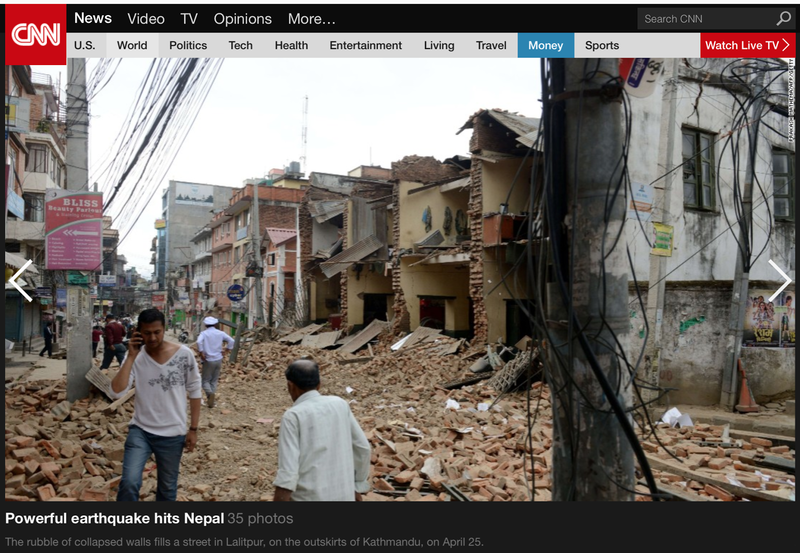 QUAKETIPS: Do the collapsed buildings in Nepal mean that you should run out of a building during an earthquake? As readers have no doubt already heard, a major earthquake hit Nepal today, estimated at magnitude 7.8, or roughly the strength of the 1906 San Francisco earthquake. Earthquakes of this size are not that unusual, but this one unfortunately hit in such a manner and location that it claimed at least 8,000 lives according to the most recent numbers that I've seen (numbers are being updated after this article's initial posting). 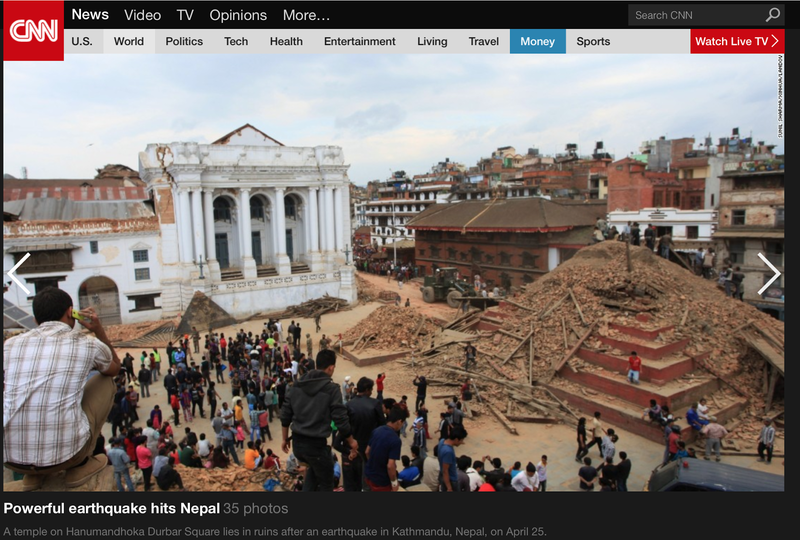 The reason that I'm posting a quick article here is that this earthquake collapsed some major buildings and there are photos everywhere of the tower, the temple, and other buildings that have been reduced to rubble with people inside. This type of event, understandably, makes people wonder if the typical advice to NOT run out of a building during an earthquake should be ignored. First, I hope that people will review a more in depth article that I wrote about this issue that focused on the 2011 Christchurch, New Zealand quake, which I feel gives a good explanation about how the odds work in a situation like this. Basically, if a few notable buildings collapse into rubble and most of the buildings don't collapse, and those that don't collapse are surrounded by rubble from the outer walls that fell into the street, then people who ran out of any building had a greater chance of being buried in rubble than people who stayed in any building. If only there was a way to know ahead of time which buildings will collapse, then we'd know when to stay and when to go. However, in most cases, you don't know, and the cruel way that chance works is that if everyone does what gives them statistically the best chance of survival, then more people will survive, but some still will not. 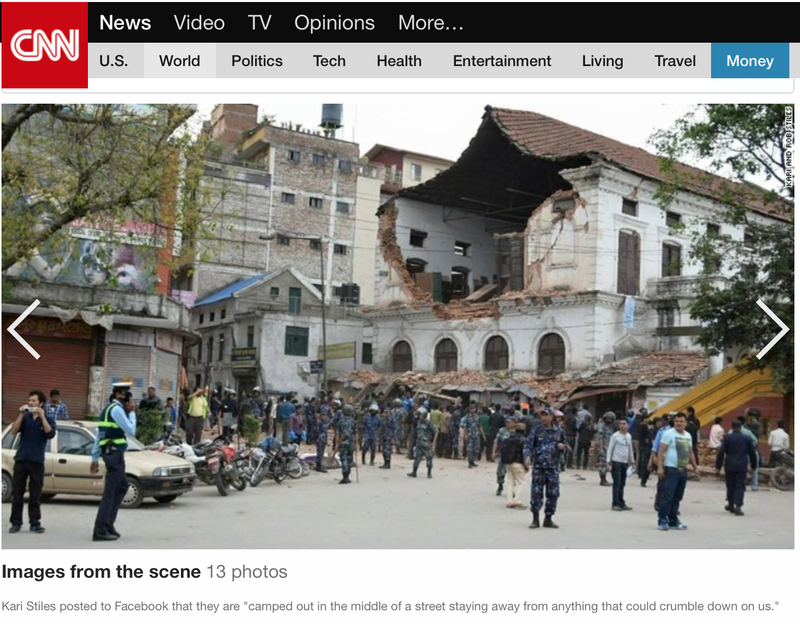 Please look at the news coverage about the damage from this quake and you will see something notable: in photos of a collapsed building that shows the surrounding area, it appears that most of the surrounding buildings have not collapsed. 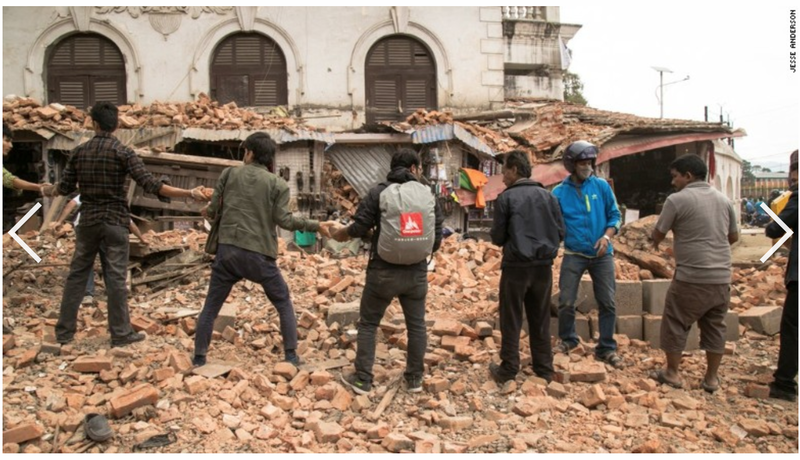 Look at more photos; there is rubble in the streets everywhere; and in many cases the outer walls have collapsed or bricks from the exterior have fallen, creating a deadly situation for those who tried to run through the danger zone outside those buildings during the quake. This happened in Nepal, it happened in Christchurch (killing many people right outside of buildings), it happened in the 1989 Loma Prieta quake in the SF Bay Area (killing five people who were next to a building at 6th and Bluxome in San Francisco, the second largest group of casualties), and it happened in the South Napa quake in Northern California last year (lots of rubble next to some buildings, although fortunately nobody died from rubble inside or outside in that quake to my knowledge). It's also worthwhile pointing out that the building standards in Kathmandu and surrounding areas are insufficient for such earthquakes, making the advice to not run out of the building even more cogent in countries with good seismic building standards. Of course, if you think there is a good chance that the building you are in is not structurally sound, then it may make more sense to run out; it is impossible to give one-size-fits-all advice in a case like that. If you are in a part of the world in which building standards are woefully inadequate, as was the case in the Haiti and Sichuan earthquakes in recent years, then I am not sure what to tell you. However, remember that if you DO run out, you are not safe when you get through the door; you are in the firing line. And of course, there is always a possibility that an unprecedented monstrous quake may flatten every building in a modern city, but this advice is felt to cover the most likely scenarios; plus, in that case, I don't know if you'd be safe anywhere! I will close by saying that my thoughts are with those dealing with the aftermath of this quake, as in all such quakes, but also that (and this is important) there is no perfect fail-safe strategy to avoid being trapped in a collapsed building in an earthquake. All you can do is to give yourself the best odds. If everyone stays in buildings during a strong quake that collapses some buildings, then some people will get trapped under rubble. However, if everyone runs out of buildings during a strong quake that collapses some buildings, the odds are that even more people will get trapped under rubble. If you follow the advice to stay inside, it may end badly for some of you, but if you run out of the building, then the odds of it ending badly for you are larger.